Columbus, Ohio is considered to be one of the best cities to live in America. Today, I give numerous reasons why it's one of the best cities for a technology career. About 5 years ago, I was picking up some food downtown and I overheard some college kids talking about "how they couldn't wait to get out of this city when they graduated." A little over a month ago, I was in a restaurant and heard another group of high schools kids mention that as soon as they graduate, "they are out of this city for good." Now, I know it's just my personal opinion of this city, but when I moved my family down to Columbus from Erie, PA in 1999, it was like moving from Powell to New York City. There is always something to do in this city. Not to mention that Columbus, Ohio is the city for work in a technology industry in the midwest. I know there are some doubters out there as to what Columbus has to offer, but based on everything I've experienced and read, this is probably the place where you want to grow a technology career. Let's get started to show off the capital of Ohio. It's one of the smartest cities...in the world. Recently, Columbus was voted as one of the Top 7 Intelligent Communities of the Year. Each one of these cities was selected to "provide role models for the world's best practices in creating competitive local economies and vibrant societies in today's hyper-competitive global economy..." and Columbus, Ohio was one of them...for the third year in a row. It's one of the best cities for a job. 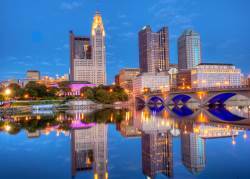 Glassdoor (as of May 19, 2015) named Columbus as one of the 25 best cities for finding a job. I can't complain there. With the exception of the Internet Bubble Burst of 2002, I have never been out of a job. Forbes also mentioned it in their 2011 Best Cities for Technology Jobs. Smart Business Columbus reported that the Praxis Strategy Group "ranked the Columbus region as the No. 8 metropolitan area for technology jobs in the U.S., up an impressive 21 spots from 2013." The Upstart Business Journal is also saying that serial entrepreneurs are turning Columbus into a Tech Hub to launch their startup. The more, the merrier. Well, I guess the secret is out. According to the U.S. Census Bureau, over the past year, Columbus has had over 12,000 people come to our city. This was the 13th largest population gain in a year. Since we have all of these people coming to Columbus (see #5), we need some fast Wi-Fi...and they are starting to lay the groundwork. PR Newswire reports that the City of Columbus is integrating Gigabit into the city's broadband connectivity. That should get everyone moving a little quicker on the Inter-webs. Remember I mentioned about the serial entrepreneurs flourishing in this city? There are a number of dedicated networking events that provide a lot of opportunities for just about everyone. The greatest part about Columbus is the fact that I-270 goes all the way around the city (Yes, you can drive in a circle for hours). You can get to any part of the city in 30 minutes or less. Of course, there are times when traffic can be unbearable, but that's why I use Waze with a RadMo. UPDATE: Even Millennials like Columbus. Money Magazine recently mentioned that Columbus was ranked #3 for Millennials saying that Columbus is a "walkable city." (UPDATE: 2017-02-02): I'm not the only one who shares this sentiment. Daniel White on LinkedIn feels the same way and says that Columbus, OH is the BEST city in the WORLD. (UPDATE: 2017-02-21): Columbus has embraced it! Lauren Sega from the Columbus Underground posted a great article asking Is Columbus Finally Embracing It's "Tech City" Status? (which in my opinion they are). (UPDATE: 2018-04-04): Columbus has a lot of happy software engineers! Kurt Badenhausen on Forbes writes about the top 10 rising cities for startups and Columbus, OH is number one. Columbus is quite a city. It's not like a New York City, but it definitely provides a number of new and unique experiences if you give it a chance. The technology and opportunities of Columbus are vast and they only seem to be expanding further. I can't wait to see what's next for Columbus in the coming years. Got a favorite location in Columbus? Did I miss a networking event? Post it in the comments below.